Big buzz builds for Step It Up, a nationwide global-warming event tomorrow. 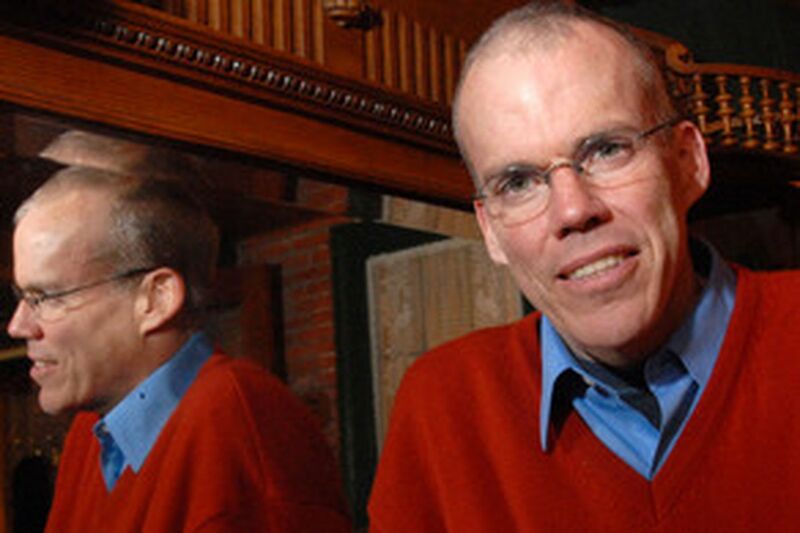 Step It Up founder Bill McKibben at the White Dog Cafe this week. "It's gone off like a rocket ship," he said of the project. Around the dinner table, they included a few hybrid-car drivers, two cyclists, a walker, a telecommuter. They've changed their lightbulbs and their lifestyles - one guy even moved in with his elderly mother to reduce his energy consumption - and now they want to change the world. Their attention was on the lanky guy in the red sweater, eco-darling Bill McKibben, who by now is also a very tired guy. Twelve weeks ago, when he launched the Step It Up campaign with no money or staff - just a Web site and a notion to stage community events tomorrow across the country to prompt congressional action on global warming - he thought he'd be lucky if 100 events resulted. Yesterday, the count was more than 1,300. "It's gone off like a rocket ship," he said. The author of The End of Nature says that to stop global warming, we need a cause with all the passion and moral urgency of the 1960s civil rights movement. His timing may be right on. Global warming has the imprimatur of scientists, the cachet of an Oscar-winning film featuring Al Gore, and the attention of statehouses. In New Jersey alone, legislators have been piling on the support for state global-warming legislation. At first, McKibben said Wednesday over dinner at the White Dog Cafe, he thought his call for an 80 percent reduction in carbon emissions by 2050 was a tad radical. Then John Edwards made it part of his presidential campaign platform. Celebs have been signing by the busload - Bon Jovi, Madonna, Beastie Boys, Black Eyed Peas - for seven Live Earth concerts worldwide July 7. In recent months, magazines from Business Week to Time to Sports Illustrated have come out with global-warming covers. Phones are finally ringing again in environmental groups' offices across the country. College students are planning a "Climate Summer" to echo the "Freedom Summer" of the '60s. Nonprofits are getting on board. On Monday, the Doris Duke Charitable Foundation announced $100 million for clean-energy grants. In 2008, look for Discovery PlanetGreen with round-the-clock green-lifestyle programs - the first of its kind, boasts Discovery Communications. There's even an animated green comedy, The Unsustainables, about a California family that tries - and often fails - to live eco-correctly. It's on YouTube, Yahoo and Google. Pamela Tudor, a Philadelphia executive coach, and other organizers have put aside their businesses briefly to concentrate on the Philadelphia rally. "Many of us feel global warming is so critical that if we don't deal with that, nothing else matters," she said. "To me, it's the overarching issue of our time." Philadelphia's group is planning speeches and performances at Independence Mall from noon to 2 p.m. It's urging participants to bring fishing rods, beach chairs, and snorkels. A banner shows floodwaters up to the top of City Hall, with Billy Penn rowing away in a little boat. Elsewhere, folks will gather atop the levees in New Orleans, go underwater to reefs off the Florida Keys, and stand atop glaciers on Mount Rainier. Dozens of events are planned throughout Pennsylvania and New Jersey, perhaps the biggest a "climate march" beginning today at Rutgers University in New Brunswick. More symbolic than an actual cross-country trek, it will continue tomorrow in Princeton, Sunday at the College of New Jersey in Ewing, and conclude Monday on the steps of Trenton's State House. McKibben has heard from senior citizens, and from a kid changing his bar mitzvah to a Step It Up event. A Texas sorority sent a photo of winsome, smiling sisters who wanted to show that supporters weren't just "hippies." There's so much buzz about global warming that BetUS.com, a Web sportsbook, has posted odds. According to them, if you bet $1 today that polar bears would become extinct by 2010, and it happens, you'd win $100. In a recent poll by Public Agenda, three-quarters of those surveyed said they were worried about global warming, up seven points from six months ago - and that was before the U.N. report that said global warming could cause food shortages and drown coastlines worldwide. Whether all this translates to action is the question. Another survey, by GfK Custom Research, found that most Americans don't know when Earth Day is and have no plans to observe it. But "we're beginning to see the attitude and the awareness shift," said GfK senior vice president Kathy Sheehan. "We don't need to have Al Gore coming here with a bunch of TV cameras anymore," said Frank Maisano, a spokesman for energy industries. "What we need is to sit down and have a serious debate on what our policy ought to be. What kind of impacts will it have, who will be hurt by it, and will it work?" McKibben first began to think about the importance of applying citizen pressure after a conversation with Arizona Sen. John McCain, who said legislators were hearing every day from big lobbyists, hardly ever from constituents. Last summer, in his home state of Vermont, McKibben led a 49-mile march from poet Robert Frost's studio to Burlington. Planners hoped to get publicity by being arrested. In the end, they failed to break any laws, but they did wind up with 1,000 marchers and the attention of elected officials. For 2007, they briefly considered the mass-movement standard - a march on Washington - but they decided it was passé. Plus, they shuddered at the vision of hundreds of buses spewing pollutants. So they decided to push local events. They chose the week before Earth Day - April 21 this year - hoping the events would complement each other. "The Earth might need more than one day," McKibben said. Indeed, observers say they are seeing the same kind of fervor that 30 years ago generated the first Earth Day but that since has been squandered. "We were all wakeful in the '70s," said Jacqui Menkes of Warminster, who was at Wednesday's event. "Then we went out and had children and started consuming." Now, "people's eyes are open," said Kateri Callahan, president of the Alliance to Save Energy, a national group. "They're responding in a way that I haven't seen in 20-plus years of working in environmental issues." Philadelphia: The main event - music, speeches, exhibits - takes place at Independence Mall (Sixth and Market Streets), noon to 2 p.m. tomorrow. West Chester: Rally around banner that says "Stop Global Warming. Cut Carbon 80% by 2050" at West Chester United Methodist Church, South High Street between Miner and Union Streets, 10 a.m. to noon tomorrow. Lambertville: Free showing of Al Gore's An Inconvenient Truth plus panel discussion, coffee and popcorn, at Rago Arts & Auctions Center, 333 N. Main St., 6:30 p.m. today. Doylestown: Green Energy Fest with exhibits and mini-seminars on all things green at the courthouse plaza, Main and Court, 11 a.m. to 2 p.m. tomorrow. New Brunswick-Princeton-Trenton: March from Rutgers (today) to Princeton (tomorrow) to the College of New Jersey (Sunday) to a rally at the State House in Trenton (Monday).